Having worked in the skin care industry for over 10 years there is one thing that plagues women about their skin, especially on their face: DARK SPOTS! DARK SPOTS!!!!! People ask me all the time: How do I get rid of dark spots on my face? Dark spots, or hyperpigmentation (the medical term) is a skin problem that can affect men and women of all ages, and can be very embarrassing and make people self conscious. It affects how we feel about the way we look. And how we look affects our entire life. I understand the difficulties of uneven skin tone and dark areas on your skin very well. Not only do 95% of my clients come see me to correct uneven skin tone, but I also suffer from an uneven skin tone problem. 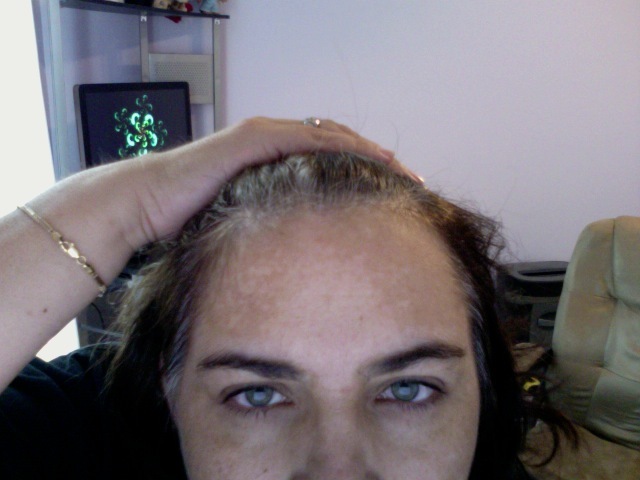 I am an olive complected Caucasian, and I have a skin condition called Melasma. Melasma is a skin condition that affects women more than men, and is caused by our hormones, (great, one more thing to blame our hormones on). It affects all skin tones (Caucasian, African American, Asian and Hispanic) people. It can sometimes be easier to see on women with a lighter skin tone (skin tone 1-2) because of the contrast between their regular skin tone and the melasma. The skin is usually “splotchy”. The dark areas do not have even borders, and can even appear like “spatters” of dark spots on the face. As if someone took a paintbrush and dipped in a darker skin tone and then spattered your face with the darker color. Then there are the dreaded spots from acne. Clients will call me and say they have “acne scarring”, or “Blemishes” or simply “dark spots” from acne. These discolorations can occur on the face, neck, chest, shoulders and back. Anywhere there has been an acne bump. Acne causes redness and inflammation many times, and in skin of color inflammation or redness commonly leads to a dark spot. The dark spots will be worse if you “pick” or “squeeze” your acne bumps. So what can you do to clear up your skin??? Well, the first step is to prevention. For melasma and sun damage that means 1) SPF 20 (at least) sunscreen on your face EVERY day that you are outside. 2) Try not to be in direct sunlight without covering your face with a hat, visor, umbrella, etc. I wear a visor ALL summer long. We went to the beach for our weekly vacation and my body was protected with sunscreen. My face was protected with a big floppy hat. I battle melasma all the time, so I protect my face from the sun as much as possible. HATS and sunscreen are your best friends. For acne the best prevention is an appointment with a dermatologist to get medication that will prevent you form continuing to get bumps. I talk more about acne and treatments here. Truly the key with acne is the proper medication to keep the bumps from coming in the first place. Second, if you do get bumps, DO NOT PICK, SQUEEZE or otherwise mess with them. That will help tremendously to avoid dark spots! The next step is products. There are prescriptions you can use to help with lightening dark spots. Specifically the medication is “Hydroquinone”. It has 4% hydroquinone which is a skin lightener in it, however it can be VERY expensive (most of the time at least $60.00 to sometimes over $100.00). For comparison, a very nice over the counter product you can use to lighten dark spots is Ambi, or Porcelana fading cream. They have 2% hydroquinone, so they are less potent than a prescription, but are more affordable. 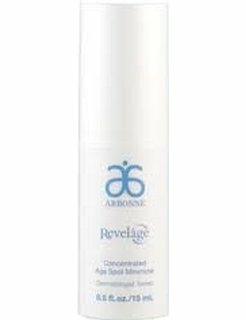 However, my FAVORITE product that I have had LOTS of success with (I use it myself and LOVE it), is Revelage Concentrated Age Spot minimizer. It is marketed for “age spots”, but works GREAT on all discoloration. I have sold this product to clients, and every single one of them has seen improvement using it. (I use it and it works for me also) As a matter of fact, most of them say it works better than the prescription Hydroquinone. It should be used two times daily (morning and night) and is botanically based which is why I love it so much. It has ingredients in there that are botanical: nutmeg oil, ferula root extract, caffeine, and licorice root extract. This product also has retinyl palmitate which is a form of Vitamin A and causes exfoliation which helps get dark spots off your face more quickly.This product works beautifully, smells great and is quite affordable. (It is made by Arbonne, and must be purchased from an Arbonne rep.) It normally retails for $47.00 but I offer it to ANYONE for $38.00 which is a 20% discount, AND I will ship it to you for free (in the Cont US)! 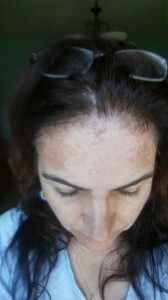 The reason I do this is because I have dealt with dark spots for years and have tried many many products. THIS is the one that has worked the fastest for me, and I GET IT!! I understand how dark spots affect your self esteem, how it feels to be unhappy with your skin and have to use makeup even in the summer (which most women HATE), and I am a firm believer in this product because it has worked for me! See my pictures above. Now, I am NOT going to tell you that this has been a fast or easy process, but I will tell you that minimizing the dark spots on my face has made me much more comfortable going out without makeup, and when I DO use makeup it is MUCH less than I used to use. Pictures tell the story and if you decide to use this product I advise you to take a before pic and an after pic three weeks later to see the difference. Yes, three weeks. If anyone tells you something works faster than that don’t believe it. It takes time to remove dark spots. The best prevention in the first place is: sunscreen, hats, and DON’T pick or squeeze your bumps. If you have acne, see a dermatologist to get medicine to help prevent the acne from coming in the first place. Please let me know if I can help. This product worked for me and I know it can work for you too!